What pleasure it can be to return to books we read and loved long ago, and find new meaning, inspiration and enjoyment! Last night, it was a collection of the short stories of H.G.Wells that includes “The Door in the Wall”, a fantasy tale that is a masterpiece of its kind. It speaks to us of essential things, including what shamans call soul loss. A wise woman shows him a book that contains his life. “It was a story about myself, and in it were all the things that had happened to me ever since I was born. It was wonderful to me, because the pages of that book were not pictures, you see, but realities….People moved and things came and went in them.” And then “at last I came to myself hovering and hesitating outside the green door in the long white wall, and felt again the conflict and the fear.” Back in the world outside the green door, he is a little boy weeping on a long gray street in West Kensington at the hour the lamps are lit. He always longs to return. Strangely, he cannot remember the games he played, only the joy of them. He makes the mistake of confiding in a schoolmate and is mocked and bullied by those with no imagination. We know feedback felons of his type in our own lives, people who have lost their own dreams and encourage us to give up on ours. As the boy grows into manhood and then an important place in the world, he feels that “some thin tarnish had spread itself over my world” . Nearing forty, he finds “the keen brightness that makes effort easy has gone out of things”. 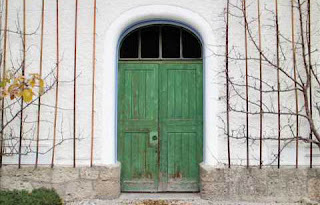 He sees the green door in the white wall again, and again – three times in one year, in different locations in the city – but he is now too busy and too set in adult agendas to pause and try to go through again. So he remains with an aching hole in himself, the place where his “child of wonder” once lived, until his death. He dies when he falls down a shaft opened by railway construction – did he mistake it for the green door in the white wall, walking home? The story speaks of soul loss, of how we lose the beautiful bright dreamer in us when we turn our back on his or her dreams. I've always liked trains. When I was a boy I would spend Saturdays riding out to the end of the train lines in Melbourne, Australia, and collecting the little timetable booklets they used to give out at each terminus. The floor of my room was wholly occupied by model Lionel trains, with little villages and battalions of toy soldiers, with which I would make Little Worlds. In later life, I've enjoyed riding trains across the English countryside, and the TGV from Montpellier to Barcelona and (when they are remotely on time) Amtrak trains from upstate New York along the Hudson River to Penn Station, a ride that can make you imagine you are sailing down the Rhine, when the state workers aren't squawking too loud on their cell phones. But I take far more trains in my dreams than in regular life. Sometimes these journeys closely resemble ordinary trips, or anticipate future ones. Sometimes they take me into a different era - to a bittersweet kiss at the Gare du Nord in Paris, on the eve of the German Occupation, before I was born - or into an alternate reality like those suggested by de Chirico's steam engines, forever puffing away beyond a wall, or the trains that can plow the sea in Japanese anime movies. As I listen to train dreams, and review my own, I'm struck by the wordplay that often puffing away with the dream engines.What line are we on? Are we on track or off track? Are we in need of new training? What's on the other side of the tracks? Are we tied to the tracks (or have we tied someone else to the tracks)? Are we in danger of missing the train? At a point in my life when I was changing lines, I dreamed I came to a station where I was in danger of missing the train. I had to push open door after door in order to get to the platform. The doors were heavy and there seemed to be no end to them. I was becoming hot and frustrated when I became lucid and realized that there is more than one way of getting over a dream obstacle. My dream self levitated, rising above the barriers, then hovered like a bird above the railyard. From this perspective, I could see that there were many lines available, not just one or two options. And I could see into the distance, getting a glimpse of what lay ahead on each of the tracks. When I remember this dream, it reminds me to try to get the big picture when approaching any decision, and that it's not enough to stay on track; we need to be sure that we are on the right track. By contrast, in an another dream my dream self was being hustled along by an incompetent tourist guide to get on board a train that was about to leave a station. The guide gave me no forewarning of the departure time and I had to scramble to get my essential stuff - my journals, camera and art supplies - together for what was supposed to be a fun day of exploration. I found myself in an overcrowded compartment with no space to read and write. I carried this "little" dream with me as a caution not to let myself be hurried by other people's agendas into following a line that isn't right for me. Though I like trains, in dreams like this they can represent collective approaches and group thinking that don't serve our creativity and our personal preferences. Yet staying on track with other people's values and approaches may be the right way to go. A woman shared a dream in which she was shown two trains that would each get her to her chosen destination at the same time. One of these trains ran on rails; the other did not. In the dream, she chose the train that stayed on track because this felt more comfortable and secure. I woke from a dream remembering only that I was sitting on a train, looking out the window and staring at a white building with an unusual shape..
Two weeks later, I was on the train to New York and as so often happens, it slowed down and came to a stop for no apparent reason. I looked out the window and was shocked to see the exact same building from my dream; it was some kind of water treatment plant. We sat for several minutes then the train carried on and I got to the city in time. What was this about? This taught me that dreams can be CLEARLY precognitive. Perhaps that was enough. There may have been a bit of symbolism in the train ride itself - that as I travel on the path of life, I am moving along with occasional stops but getting to my destinations. 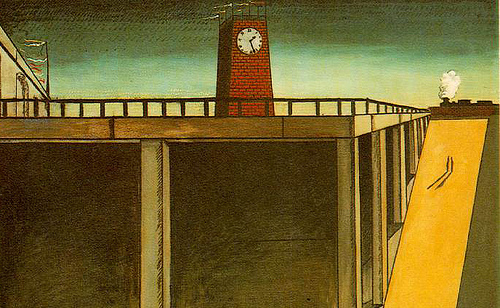 There is urgency, or sadness, in some dreams of trains. We are worried we are going to miss a train, which seems to represent a life opportunity. We are parting from someone we love, as did another women dreamer who waved a tearful goodbye to her husband as his train pulled out of a station the week before he died from a heart attack. A mother who lost her son tragically young dreamed that she and her surviving boy accompanied him to the far side of the railroad tracks, and had to leave him there. Then there are the trains that take us into another realm, like the Hogwarts train that leaves from platform 9 3/4 in the Harry Potter stories. Michele dreamed she was in the desert, looking at an immense lion sculpture that reminded her of the Egyptian Sphinx. As she watched, the great lion rose from the sand and became the engine of a train that carried a happy band of children off on magical adventures. This dream inspired her to create an illustrated children's book and to help children with their dreams. Any future we can see (in dreams or in other ways) is a possible future. The odds on any specific event being enacted are constantly shifting, and we want to take a probabilistic, rather than a deterministic, attitude towards our previews. We want to experiment actively with the possibility that we can help to manifest, or avert, an event foreshadowed by a dream by how we use or fail to use the dream information. To foster our understanding that none of this is exactly new practice, but rather part of a basic human survival kit, let me describe four cases from the history of dreaming, the kind of history that is not (yet) taught in schools but is essential to our understanding of the human odyssey. In each case, a dreamer’s ability to scout ahead was used to benefit a community in ways that saved many lives. Living on the edge of survival, threatened by constant warfare, hungry winters and white men’s diseases and land-stealing, the Six Nations of the Longhouse Indians of the American Northeast – known to anthropologists as the Iroquois – made it the first business of the day to scan the dreams of the community for clues to the future. The term “dreamer” (atetshents) was a title of honor that also meant “doctor” and “healer”. While everyone dreams, some people dream stronger and truer than others, and those are the ones – when their insights have been tested and proven repeatedly – when you need to make a decision on which the safety and well-being of the people depends. I spent several years studying the shamanic dreaming practices of the Iroquois after I started dreaming of an ancient Huron/Mohawk “woman of power” (arendiwanen) who insisted on communicating with me in her own language, which I was then obliged to study. My favorite documentary source on early Iroquois dreaming was the Jesuit Relations, a vast compilation of reports from the blackrobe missionaries who lived among these peoples in colonial times. Father Bruyas, a Jesuit living with the Oneidas in the 17th century, left a striking account of the practice of an Iroquois dream seer and how the community used her information. The Oneida dreamer reported that she had dreamed that an enemy tribe from the South would try to wipe out her village in a surprise attack. She described the place where her own warriors could ambush the enemy, and predicted that the enemy war chief would be captured and burned to death. Following her directions, the Oneida war captains set an ambush at the place she described, so confident of their victory that they fired up their kettles in advance for the celebration feast. In 1558, under the reign of Catholic Queen Mary I, the Protestant minister John Rough was "sore troubled" when he dreamed that he saw two of the Guard leading the deacon of his congregation, Cutbert Simson, off to interrogation. Rough was especially troubled because, in the dream, the deacon was carrying a book listing all the members of the underground Protestant community; if this fell into the hands of the authorities in this age of religious persecution, all of them would be at risk. In the middle of the night, Rough told his dream to his wife and then tried to calm himself by reading. When he fell asleep, however, he "dreamed the like dream again." Now profoundly agitated, Rough prepared to pay a visit to the deacon and to tell him the dream, certain that it was a warning. In the way of synchronicity, the deacon turned up at the minister's door first. When Rough told his dream, the deacon dismissed his fears, insisting that dreams are "but fantasies, and not to be credited." Rough had to call on his full ministerial authority, ordering the deacon in the name of Almighty God to place the book in safekeeping. The deacon, protesting, gave the book to Rough's wife. Soon after, Cutbert Simson was arrested and interrogated. The Reverend Rough's dream - and his insistence that its warning must be heeded - saved the whole congregation from exposure to the authorities. In 1988 Sofia, a school teacher in the Armenian mountain village of Shirokamud, dreamed she felt the earth trembling while class was in session. In her dream, she instructed the children in the classroom to join hands and follow her. She led them to safety, without hesitation, through a maze of mountain trails and woke with clear recollection of the path she had followed. The dream felt so “real” and so menacing that Sofia recounted it to fellow-teachers, who scoffed at her. She decided on her own course of action. Without mentioning the dream, she instructed the children in her class that if anything “bad” ever happened they were to join hands and follow her without question. Three days later, two earthquakes measuring 6.9 and 5.8 on the Richter scale destroyed the school. 112 children died immediately; others were burned to death in the aftermath. The only children who survived were the members of Sofia’s class. When she felt the first tremors, she immediately acted on her dream guidance, leading her pupils to safety, joined hand to hand, along the complex mountain trail she had dreamed. The terrible Asian tsunami of December 26, 2004, brought home that the web of dreaming can be essential to survival. In late December, the Andamans are usually to be found in their seasonal fishing settlements along the coast. After the tsunami roared through that year, their shelters were gone. 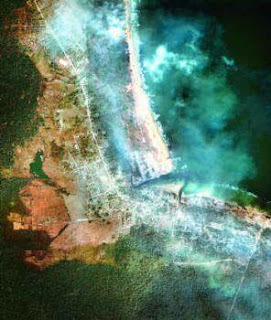 The Indian government, which claims possession of the islands, assumed that the Andamans along the coast had been drowned. Then the islanders reappeared on their forested hills. They knew the tsunami was coming, and got out of its way by quietly abandoning their fishing huts and taking to the hills. They knew because they observed the movements of animals, and listened to the voices of wind and water, and because they know how to dream as and for a community. 1.Robert Moss, Dreamways of the Iroquois (Rochester VT: Destiny Books, 2004) p.35. 2. John Foxe, Acts and Monuments of the Church Containing the History and Sufferings of the Martyrs (1563) cited in Carole Levin, Dreaming the English Renaissance (New York: Palgrave Macmillan, 2008) p.2. 3. Robert Moss, The Secret History of Dreaming (Novato CA: New World Library, 2009) p. 270. For an account of Andaman dream webbing (written before the tsunami, see Vishvajit Pandya, “Forest Smells and Spider Webs: Ritualized Dream Interpretation Among Andaman Islanders” Dreaming 14:2-3 (June-September 2004) 136-150. Your departure lounge for adventures in lucid dreaming is open to you anytime you are ready. It is is the twilight zone, the half-dream state on the cusp between waking and sleep, and between sleep and waking the French used to call dorveille. Frazzled by the pressures of everyday life, many of us tear through this zone without pausing to notice the magic that is there. Active dreamers tend to spend a lot of time in the twilight zone, even whole nights. In everyday life, the easiest way to embark on conscious dream journeys is to practice maintaining full awareness as dream images rise and fall during twilight states. The twilight zone offers optimum conditions to develop your ability to make intentional journeys beyond the physical body to learn the nature and conditions of other orders of reality. As you spend more time in the twilight zone, you will discover a notable increase in both your creativity and your psychic awareness. Going with the flow of spontaneous imagery in the twilight zone puts you into the stream of the creative process. It puts you in league with your creative source, mediated by mentors who appear to you in the half-dream state, or coming through cool and clear as a mountain spring. It is no accident that highly creative people — from Einstein to the romance writer and the powerboat designer I met on plane trips — are very much at home in the twilight zone. In this borderland, you will find the gates to other worlds opening smoothly and fluidly — if you let them and are prepared for what may follow. When I allow myself to drift through this frontier region with no fixed agenda, I have the sense of leaning through a window or a doorway in space. Sometimes this feels like hanging out of the open hatch of an airplane. I have come to recognize this as the opening of a dreamgate. Depending on circumstances and intention, I can step forward into the next dimension or haul myself back into physical focus. I am floating in a twilight state, shortly before dawn. I watch a parade of faces. I step forward, leaving my physical body on the bed. I have the impression of immensely tall doors. Beyond them, shining through the gape, is deep blue-green light. I move towards it. I find myself in the astral sea. It has substance, but this substance is lighter than foam rubber and endlessly malleable. I see temples and palaces rise and dissolve back into the matrix. I seek clearer understanding. I am told by a higher intelligence that I am in the “high subplanes of the astral.” The inhabitants of these realms can create their environments by thought and are aware of this ability. But they still work with the inheritance of earthly lives and memories of form. I slip into a more vivid scene of construction. I am amazed by the detail of this work. Is it due to the limited understanding of the astral builders — or will it give greater substance and beauty to the finished structure — or is it simply part of their pleasure? What's going on in your dream house? When you record your dreams, pay special attention to the dream locations. The settings may be familiar or completely foreign, vivid and sensory or cloudy and indistinct. You may be in a place whose physics appears quite different from ordinary reality. You may be at home with people you don't know in regular life. You might be living in a medieval castle that seems to have been constructed yesterday. Again and again, you dream you are in the old place – back in the home you shared with your ex, or the office where you worked at the old job, or at grandma’s house, or in the school yard. Maybe you’ll want to ask yourself: did I leave part of myself behind when I left that old situation? Maybe your dream house is a hybrid, melding elements from places you recognize from the past with novel architecture. The house may seem familiar at the outset, but then proves to have more rooms and more stories than you remember. These may be stories of your life and levels of your psyche or Self. It can be fascinating to revisit a dream structure of this kind through conscious dream reentry, and learn more about what is going on. Jung found in his dream of a many-layered house - a dream Freud insisted on misinterpreting - a model for understanding connections between the conscious mind, the personal subconscious and the collective unconscious. In his dream, he started out on a floor that looked like a normal bourgeois home. As he descended through successive floors, he found himself in primal territory, in a dirt-floor basement containing skulls and bones of distant ancestors. I find it especially intriguing to go up on the roof of a dream house. Sometimes I find there are levels beyond what I expected. Sometimes, on a roof terrace or garden, I meet a benign figure I recognize as a slightly higher self, a witness self who can give me perspective on my life situation, since he is up above the scrum. I have called this figure the Double on the Balcony. Last night I dreamed I was in a house that I used to own, in another reality. It was quite familiar in the dream, but does not correspond closely to any house I have occupied in this world. My dream house was a palace, with sections open to tour groups. It has sweeping marble staircases leading up to what used to be private family apartments and my library. I tried to go up the steps, but they petered out and I realized the the library and the private rooms had been long since abandoned and sealed off. I did not give up on my detective work. I took another staircase to a balcony with wonderful views over green forests and meadows. I told ladies I met there, matter-of-factly, "I used to own this house." I know I will come here again. I need to get up that staircase. And I need to understand what life story I am inhabiting in this palace that has seen better days. By focusing on a dream location, we have an excellent portal for conscious dreaming, shamanic journeying and astral travel. If you have been to a place in a dream, you can go there again, just as you might return to a place you have visited in ordinary reality. Your dream house may be a place you will visit in the future. I have been guided, in while series of dreams, to houses I did not recognize at the outset but proved to be future homes that I purchased and occupied. We take real estate tours in our dreams. The dream house may be a structure that the astral architect in you has constructed for various purposes: as a place for rest and relaxation, as a sanctuary or a study, as a place of rendezvous, as a pleasure palace. Such creations may have their own stability. They may be homes that await you in the afterlife or interlife. Your dream house may be a place where you are leading a parallel life with people you may or may not know in your physical world. It may be a construction or renovation site, a place waiting for our imagination to raise the walls or put on the finishing touches. 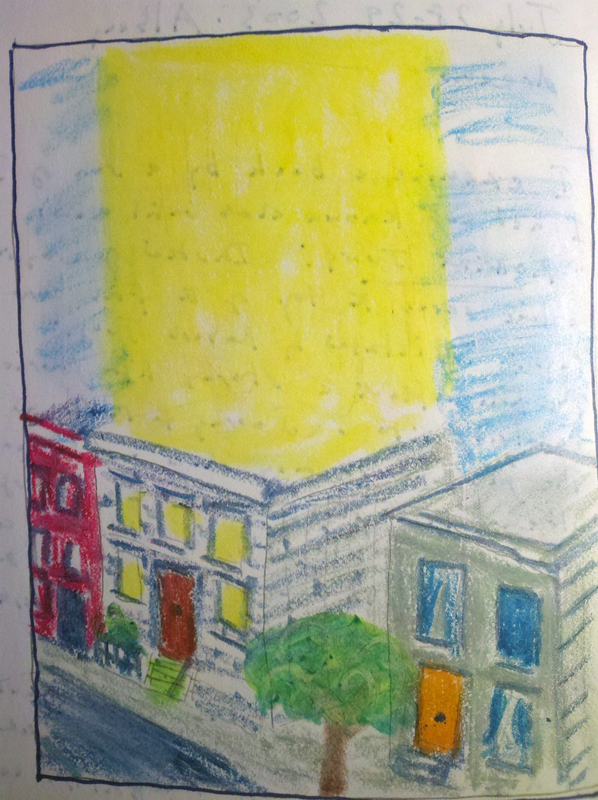 Art: "House of Light", drawing from Robert Moss journal. 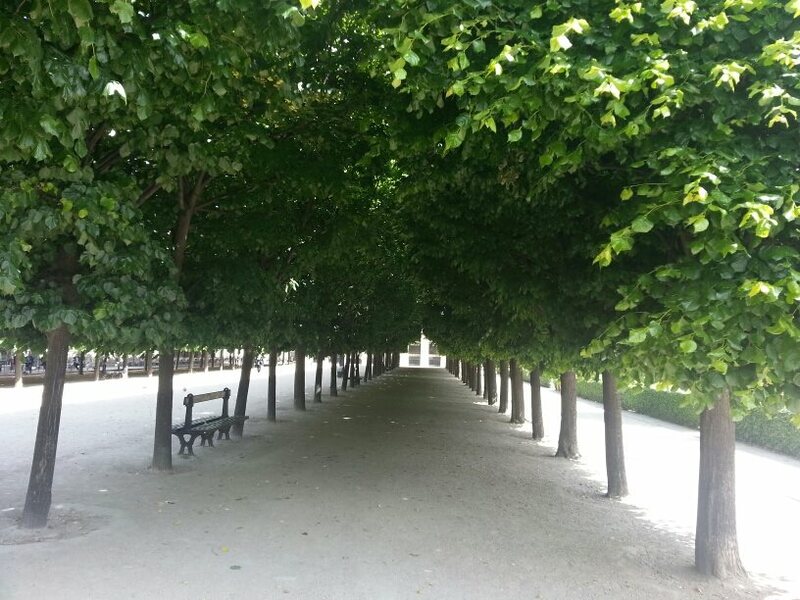 In the collective imagination of Islam, paradise is a garden. In the Ottoman world, gardens are places where friends come together, where wonderful parties unfold, where joy and romance are easy, where the seeker finds the spiritual master, where the living and the worthy dead rub shoulders. The maturation of a person in spiritual and life terms is likened again and again to the opening of a bud. The bud becomes a flower. Sometimes this sets a whole garden astir with blossoming, delighting the senses with color, perfume and the susurrus of silken petals. A book may be a garden of ever-living plants. Ottoman biographical dictionaries are often called gardens: The Garden of Roses, the Garden of Peonies, even the Garden of Truths. The last is the title of a biographical dictionary by the poet and provincial kadi (judge) Nev’zade ‘Ata’i (d. 1637). He studied a thousand lives, of people from the generation before his, and planted these in formal rows in the garden of his book. He took only subjects who had died and gone into the earth. The fact that his subjects were dead did not mean that they could not speak. He reports face-to-face encounters with the dead, in a garden, or at a gravesite, or at the threshold of a home. We can enter his world, and the gardens of Ottoman dreaming, through the pages of Dreams and Lives in Ottoman Istanbul by Aslı Niyazioğlu, a history professor at Koç University in Istanbul. We learn that for Ottoman officials, dreams were especially prized as a way of gaining counsel on career decisions; there is a practical edge to how they compared dream reports. In a society that valued dreams, a dream report might be a way to promote a case or a cause. Versed in current scholarship on dream sharing in other early modern societies, from Mughal India, Safavid Iran, Habsburg Spain, Ming China, Aslı Niyazioğlu makes an important contribution to the history of dream sharing and how identities are constructed in different societies. We can almost hear the dreams being swapped at garden parties, by Sufis in the dervish houses, by students in the religious schools, in private homes. Ottoman biographers often included dreams in their narratives. “They referred to dreams as mirrors that reflected the divine world that was hidden from ordinary eyes.” In times of opportunity, as in times of unease, students and officials looked for role models as they sought tools to survive and thrive. The full title of 'Ata'i's compendium is Garden of Truths in the Completion of the Peonies. Why peonies? I thought of those thick, ruffled blooms, ability to come back spring after spring for a century or more, and traditional associations with abundance, prosperity, fullness. In Ottoman lives, dreams are shown to be guidance on practical decisions and career moves. It is also recognized that dreams can open the eye of truth, what Ibn 'Arabi called the eye of the heart. The bureaucrat Latifi [d.1582] recounted a memorable case of how the voice of conscience may be heard in dreams. The case involved a judge who gave up his career after he dreamed that on the Day of Judgment water mills crushed the heads of corrupt judges; the mills were powered by the blood of their victims. In this period Sufi sheikhs used dreams in the training of their disciples, especially in the Halveti and Bayrami orders. The Halveti leader Sinan Efendi wanted disciples to tell all their dreams to their sheiks. Dreams selected by Ottoman biographers are typically clear and direct. These were held to be characteristics of a true dream. Asli sees Ottoman dreams as “bridges between different realms…between the living and the dead, the past and the future, the human and the divine". This is a world where dreams change lives, the dead appear in broad daylight, and biographers invited their readers into gardens of remembrance where the departed will bloom again like peonies in the spring. Interaction between the living and the dead is constant in Ottoman biographies. The dead may appear at your door, or in a dream or both; it’s not always clear which reality you are in at the moment of encounter. In one of ‘Ata’i’s stories, an Ottoman sailor in North Africa is woken from a nap by a servant who tells him that his beloved friend, a sea captain reported dead three years earlier, is at the door. They embrace, they pass a couple of delightful hours together, then the friend leaves and the sailor is overcome by sleep. When he wakes, he hastens to tell his friends about the visit. He is amazed when they insist that the captain is indeed dead. No reason is given for the visit except the natural desire of good friends to spend time together. Rumi appears to welcome and bless a sheikh who travels to Konya, the poet-mystic’s domain. 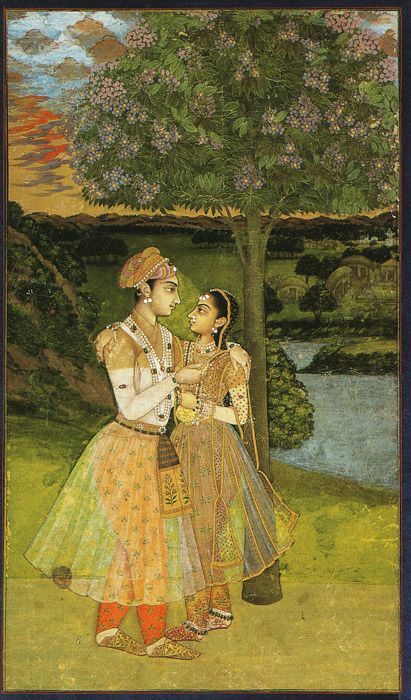 He appears at a sema and draws a skeptical sheikh into the turning dance, making him a convert. “I could not stay still”. A dead lover appears to his grieving boyfriend and leaves a physical token. In 'Ata'i's time, one preacher condemned visits to grave sites from the minbar of Ayasofya, while another praised them from the Blue Mosque just opposite. For 'Ata’i the wise dead are “guardians of the world”. Their bodies are beneath the earth, but their spirits open like wonderful ever-growing flowers. Let’s notice these were scary times. The paranoid Sultan roamed the streets of Istanbul at night with his guards, sniffing for any tell-tale trace of tobacco; if he catches anyone smoking he will have him killed. Anyone caught walking without a light was also subject to immediate execution. The author of the Garden of Truths steadies himself in dangerous times with the knowledge that he has allies and bonds beyond death. He presents himself as custodian and gardener for wise men accessible to him in dreams. As a gardener, he removes weeds, prunes, fertilizes, displays unique plants. Asli Niyazioğlu has rendered a tremendous service to the history of dreaming - which must also be a history of the role of dreams in social interaction - in this careful and fascinating study of Ottoman dreams and biographies. According to his biographers, when Ibrahim Tennuri wanted to become a disciple of the Bayrami sheikh Akşemseddîn (d. 1459), the sheikh asked him about his dreams. As he could not remember any, he was placed in a retreat for forty days. The retreat worked: he had a hundred dreams and remembered each with great precision. 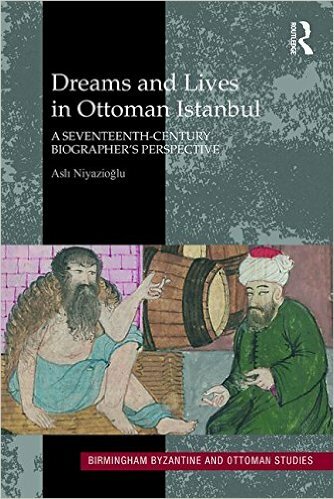 The subject of this review article is Dreams and Lives in Ottoman Istanbul: A Seventeenth-Century Biographer's Perspective by Asli Niyazioğlu. Published by Routledge for the Birmingham Byzantine and Ottoman Studies Series, 2016. 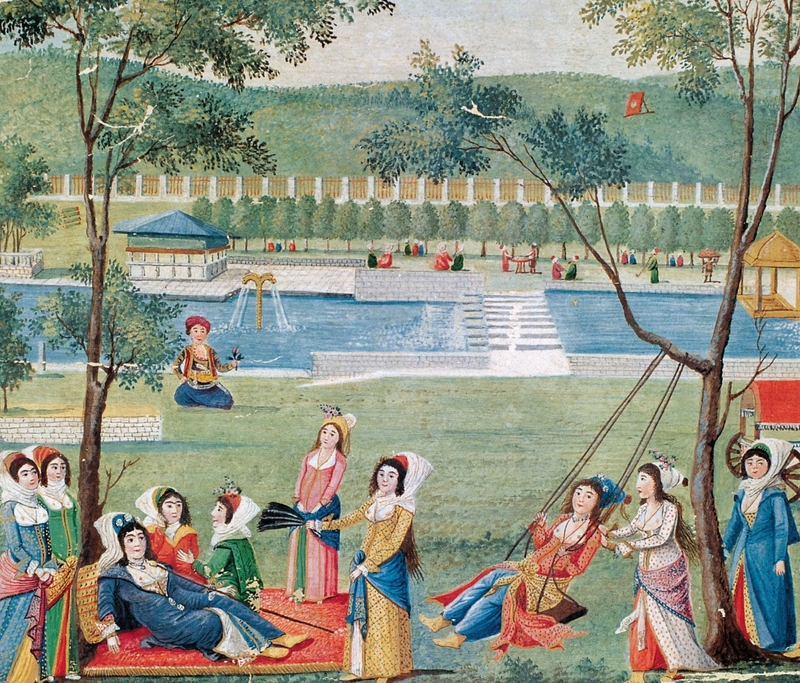 Art: anonymous painted illustration of the garden of Sa'dabad at Kağıthane, Istanbul, ca. 1720. The French medievalist Michel Stanesco describes dorveille as "a sort of second state where the protagonist, half sleeping, moves in an inherently ambiguous universe, between the near and the far, the strange and the ordinary, the mysterious and the familiar." My friend the French dream teacher and scholar of medieval poetry and music, Sophie Bordier, gives the following account: "La dorveille is a word of ancient French that first appears in the 13th century, It defines a phase of semi-vigilance that is highly propitious to creativity, prayer and visions. 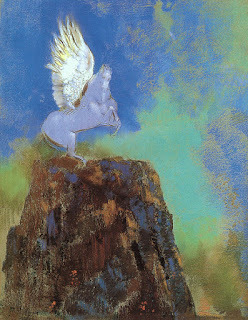 It is an expanded state of consciousness that connects us with the source of oneiric and poetic imagination. 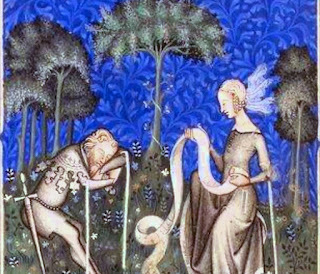 "Dorveille, or dormeveille, can occur as we approach or leave sleep, but also in the interval between two sleep cycles that characterized the nights of our medieval ancestors. The slept in two distinct phases: an initial period of deep sleep ("sleep of the dead") and a second period of lighter sleep, rich in images, apparitions and premonitions. When the sense (virtutes animales) are dormant, the soul can more easily slip free from the body, according the the medical theories of that era." This liminal state opens for each of us every night, though we generally flit through it without noticing. It is great practice for growing consciousness to set yourself the intention of lingering in this twilight state. As images rise and fall, you can choose to follow one that has special attraction, and so find yourself embarked, effortlessly, on an adventure in lucid dreaming. In his poem Le joli buisson de jonece (1373), Froissart describes being transported into a marvelous space “round as an apple” from a state of dorveille. This began when he went to bed early on a dreary winter evening and felt himself touched by fire. As he drifted towards sleep, thoughts and memories rose and became visions. Then Venus – he says– carried him to that apple-round space. The colors were blue streaked with white but they changed with the winds. He can’t tell the size of the space he is in but he is always at the center. Inner guides are easily accessible in this state. Creative connections are made that escape the ordinary mind. So: let's agree to spend more time in dorveille. And why not borrow the word, absent an equally good one in English? We imported déjà vu, so we can manage this too. Michel Stanesco, Jeux d'errance du chevalier médiéval: Aspects ludiques de la fonction guerrière dans la littérature du Moyen Age flamboyant (Leyden: E.J.Brill, 1988) 149.
τύχ᾿ ἀγα|θᾶι· Κρής ἐστιν ὁ | κρίνων τάδε. I judge dreams, having the mandate of the god. To good fortune! The one judging these is a Cretan. The text is on the shingle of an ancient dream interpreter at Saqqara in Egypt in the Ptolemaic age, 2nd century bce. Scholars debate the identity of the god he declared to be his patron, but a good guess would be Serapis, a composite deity who melded aspects of Hades, Osiris and the Apis bull. Serapis was a lord of death and of healing; the famous pool at Bethesda belonged to him before it became part of the Christian story. We know that the training of a kathodos, or candidate for initiation, in the ancient precincts of Serapis centered on incubating and working with dreams. We have records of a candidate in the time of Cleopatra being assigned to spend a whole year recalling and reporting dreams to his mentor. The image above is a wonderful gypsum copy of the stele mounted in front of the dream interpreter's kiosk. 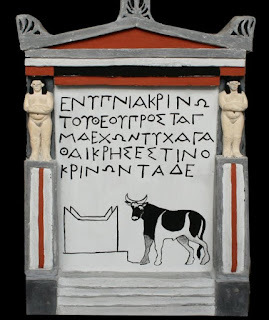 In the painted scene a bull approaches a horned altar. 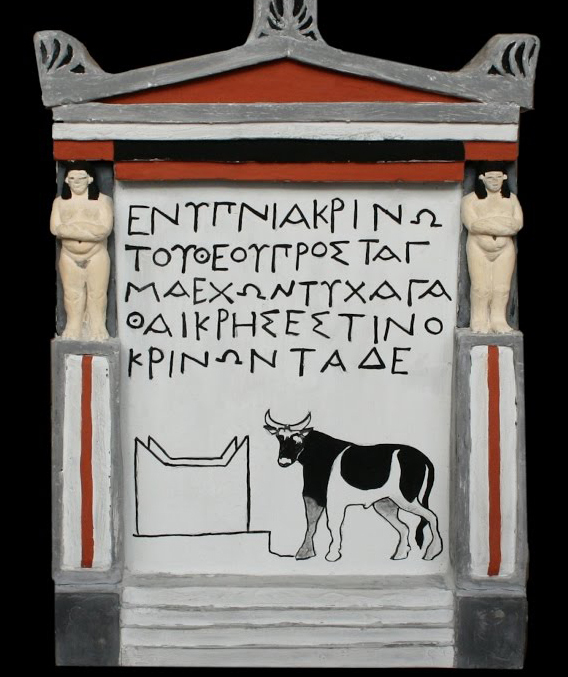 The bull was sacred in both Egypt and Crete and was the favorite animal form of gods around the ancient Mediterranean and Middle East. A very dramatic form of dream incubation was practiced in a mausoleum of bulls at Saqqara where the supplicant slept amongst mummified bulls encased in giant sarcophagi. The dream interpreter at the sign of the Bull plied his trade near the Anoubeion, the House of Anubis. Very appropriate, since the canine-headed Anubis was the patron of dreaming and soul travel as well as the guardian of the portals to the Otherworld. This was a busy commercial district, with constant traffic between two great temple complexes at either end of the street, the House of Anubis and the Serapeion, the Temple of Serapis. There were lost of vendors and small businesses. The dream interpreter sat in a booth behind his sign, waiting for trade. By identifying himself as "Cretan", he may have hoped to appeal to the Greeks and Macedonians who now ruled Egypt under the Ptolemies, in the wake of the conquest by Alexander the Great. We don't know exactly what the dream reader at the sign of the Bull did for his clients, but his prime location suggests that he did not lack business. In his age, it was generally believed that dreams are a field of interaction between humans, gods and others, and that dreams often reveal the future. Everyone knew that dreams are important, so important that help may be required to determine the exact meaning, to decide on appropriate action to be taken, and to disperse or ward off bad energies that may be operating during the night. According to Aristotle (a skeptic in regard to dream precognition and transpersonal communication) we need help with the meaning of dreams because the images are distorted: “dream-pictures, like pictures on water, are pulled out of shape by movement”. An older and more popular view was that we need help in discerning the origin and nature of dreams because not all of them speak truth. Some may be deceiving messages dispatched by evil spirits or manipulative “dream senders” (oneiropompoi). The Greeks thought that Egyptian sorcerers were especially good at this. It was said that we may need help in reading dreams because “the gods love to speak in riddles” in order to test us and goad us to expand our understanding. Our dream interpreter at the sign of the Bull claimed something more, a special connection with a greater power. "The mandate of the god." For a full discussion of ancient dream interpretation, please see chapter 2, "Interpreters and Diviners" in The Secret History of Dreaming. Shall these texts live? This is a major challenge for the historian of dreams in other eras. A dream is not a text; it is an experience whose full nature and dimensions can only be glimpsed in even an extensive dream report. If we are working with contemporary dreamers, we may have the opportunity to enter that fuller experience with them, through careful questioning to elicit details that are initially flown, and even by traveling with them back inside the dreamspace, through the techniques I call dream reentry and tracking. However, this option is not obviously available when we are trying to fathom the dreams in the personal diary of an eighteenth-century Quaker physician, or the dreams attributed to an anonymous Huron/Wendat by a seventeenth-century French Jesuit. When we are examining reports of dreams collected by outsiders with very different agendas from native dreamers, the challenge of remoteness in time is magnified, because now we are seeing through a distorting lens. Close study of the context of dreams, and especially of the way they are shared and valued in a certain time and culture, brings us closer. A history of dreams must be, to no small degree a history of dream sharing, and this is what the authors of Dreams, Dreamers and Visions have given us, in a remarkable collection of essays that explore and compare patterns of dreaming on both sides of the Atlantic in the early modern era. The editors set the stage beautifully in their introduction, announcing that “dreams and the struggle to explain them offer a unique vantage point from which to examine the social construction of truth and meaning in an historical period often considered the crucible of the modern world.” In societies that value dreams and visions, the sharing of a dream may be the assertion of authority and a claim to divine favor. When dreams are regarded as prophetic or direct messages from divine powers, a dream can be a mandate for revolt or reformation. In history, dream sharing has been “a means through which to assert oneself in the social world” and “a power-laded form of communication.” In societies where dreams are valued and regarded as possible messages from the divine, some kind of dream police often arises. If dreams are known to be powerful, there will always be those who want to hijack that power. So we see church authorities ruling on whether a dream comes from angels or devils or is mere trash to be thrown out. In many languages, you don’t say that you “had” a dream; you say that you “saw” a dream. 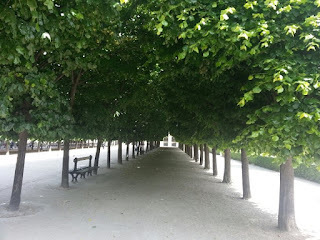 In a fascinating discussion of the valuation of inner sight, Mary Baine Campbell reminds us that rêve the French word for “dream” that supplanted songe in this period, arises from verbs that mean “roving” (or “raving”). Its first appearance in print may have been in Le Jeune’s account of Iroquoian dream practices in the Jesuit Relations, the huge compilation of blackrobe reports from New France in the seventeenth century. Janine Rivière’s elegant contribution on night terrors will win the sympathy of contemporary sufferers from the misnamed phenomenon of sleep paralysis (it is parasomniac, “around sleep”, not of sleep) though early modern explanations (from demonic invasions to the effects of lying on your back) are unlikely to be found helpful. The middle part of the book explores the encounter between Europeans and the dreaming practices of indigenous Americans, and it is a mine of fascinating materials. Carla Gerona takes us, with the Franciscans, into Texas border country where dreams from the Old World and the New World corresponded and collided. 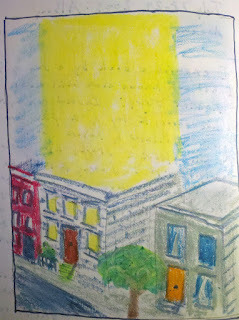 Both the missionaries and the Hasinai became obsessed with sightings of a flying blue woman. Such a being was central to native mythology, but the Franciscans made a determined attempt to persuade the Indians that they were seeing a flying nun – Sister Maria de Jesús de Agreda, who was credited by church authorities with accomplishing some 500 bilocations, appearing in the New World while her body was in convent in Spain. Indigenous connas (shamans) were widely credited with powers of flight, but the Franciscans were quick to condemn such reports as deceptions of the Devil. Meanwhile, either bereft of spontaneous dreams or fearful of them, members of the Texas mission cried for visions and sought magical powers by fantastic austerities. 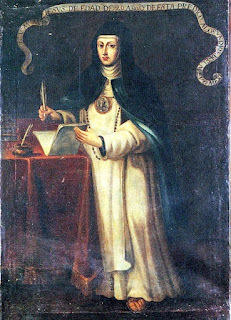 Andrew Redden explores how the Jesuits sought to reshape the indigenous imagination in Peru and Mexico towards conversion by the judicious dissemination of dream reports favoring their cause. Leslie Tuttle gives us a finely crafted study of the mentalité that shaped the attitudes of French Jesuits before they made the crossing to New France. She adds a very useful analysis of how the Jesuit Relations were composed and disseminated, giving the educated Catholic world a view of Canada and indigenous ways that was in many ways “a Jesuit rhetorical creation”. 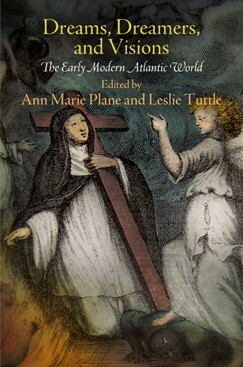 The scholarly thriller in this book is Emma Anderson’s excellent study of the visions of Marie de Saint Augustin, a nursing sister who presented herself as guided and even possessed by the spirit of Father Jean de Brébeuf, who was fire-tortured to death by the Iroquois in 1649 and eventually canonized. Marie served the pulverized bones of Brébeuf to the sick, and claimed they produced miracles. After she saw the Jesuit martyr crowned, with a dove in his heart, in a big vision, she gained influence over men of power in Quebec, and was even able to make and break bishops. While talking to the apparition of Brébeuf – and conceding at times that he may be an aspect of her own greater self – she is also demon-haunted, puking at the idea of taking the eucharist. The elements are all here for both a depth psychological study and a superior horror film. In her splendid contribution on dreaming in the British Enlightenment, Phyllis Mack observes that dreaming was “the most credible means of experiencing a connection to the divine or inward change". Dreams were “a universal source of fascination” though there was a “combustion of opinions” about their sources and reliability. In popular street literature, dreams might come from the Devil or from a witch’s spell, or be caught like a contagious disease. Physicians spoke about glands and heavy meals too close to bedtime. But repentant former slave trader John Newton, who wrote “Amazing Grace” declared that dreams can deliver divine energy and offer proof “the soul, without flesh, can act” – and will therefore survive death. Mack takes us through the rise of “a virtual dream culture” among Arminian Methodists and Quakers, who made a regular practice of sharing dreams and used nightmares as wake-up calls. She gives us a welcome reminder of one of the best 1,500 words on dreams that have ever been written, a 1712 article by Joseph Addison in The Spectator in which he explains that dreams are generated from within the dreamer but independently from the conscious self – and so offer proof of one of the preconditions for immortality, the capacity of the soul to operate outside the body. In a final essay, Matthew Dennis revisits the dreams of the Seneca prophet and recovering alcoholic Handsome Lake, which gave rise to a new religion, as explained in Anthony F.C.Wallace’s magnum opus The Death and Rebirth of the Seneca. Dennis’ contribution is distinguished by his attention to how the codification of the Gaiwio asserted patriarchal claims to authority that were absent from earlier Iroquois society, and by the way he situates the Seneca revival in the spiritual geography of the “Burned-Over” region of upstate New York that was a hothouse for new religious movements in the nineteenth century. There is a glaring hole in this book. It is disappointing that there is no treatment of Africa in a collection devoted to the “Atlantic world.” I made a small attempt to construct a picture of shamanic dream practices among the peoples of the Gold Coast who were Harriet Tubman’s ancestors – and possibly a partial key to her prowess as a dream seer who helped liberate many fugitive slaves before the American Civil War – and I would love to read a scholarly treatment of this theme. 1. 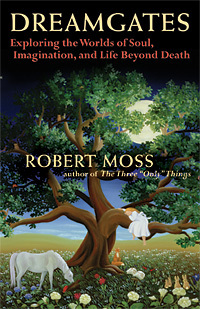 Robert Moss, Active Dreaming (Novato CA: New World Library, 2010) 49-60. 2. 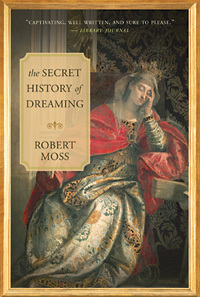 Robert Moss, The Secret History of Dreaming (Novato, CA: New World Library, 2008) 163-176.